Rev. O’Connor received her Master of Divinity from Perkins School of Theology, SMU in 2006. She was commissioned in 2010 and was ordained June, 2013, at the North Texas Annual Conference. The Rev. O’Connor served as sole pastor of First UMC Trenton for four years. Prior to that she was associate pastor of First UMC Paris, Texas, from 2006-2010 after having served as lay pastor of First UMC of Rowlett from 1993-2006. Previously, the Rev. 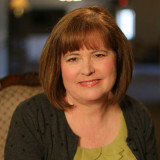 O’Connor worked 16 years in nursing after receiving a Bachelor of Science in Nursing from UT Nursing at Houston. I had this painted on my wall in one of my homes and I used this scripture for my first sermon I gave on Laity Sunday. Words to live by: Jesus died for me, so I will live for Him. Family Members: Married to Patrick O’Connor in 2010. We became a family with eight children and currently 12 grandchildren. Seven of the eight children are female. We are still waiting for the day we have all of them together in one place. But until then we enjoy them when we can. Our son Michael and family live in Blossom, TX; daughters Wendy & Sherry and families live in Up State New York; Amanda lives with her family in McKinney; Hayley and family live in Rhome, TX; Trish is moving with her husband to California; Tara lives in Lubbock, TX; and the baby, Mary is still currently at home but planning to leave the nest soon. Hobbies, Interests: I love to go to the movies with Patrick, spend time with the grandchildren and since Patrick is now a Realtor we love to tour open houses and visit new home builders. We also enjoy water aerobics together and long walks and talks. What do most people not know about you? I cry at Hallmark commercials! Who has inspired you the most in your life and why? I would have to say my maternal grandmother. I was only 8 when she died but I remember her vividly. She was a great mom of six children, a loving wife but most of all she was a child of God. She taught me by example from a very young age how important it is to read God’s Word and to pray for others. God was the center of her life and each evening she would take her Bible off the mantel where she kept it and read from it. She would get down on her knees on the hard wood floor and pray for the needs of others at bedtime each evening. Favorite Movie: Home Alone 1 and 2, it makes me laugh!